As Tahoma High School’s administrative staff began to report on their section of the Site Plan, I noticed a distinct shift in the energy and sense of urgency conveyed by the middle school principals. THS administrators downplayed the needs of Level 4 students and announced their intent to focus efforts on the Level 1 & 2 students. 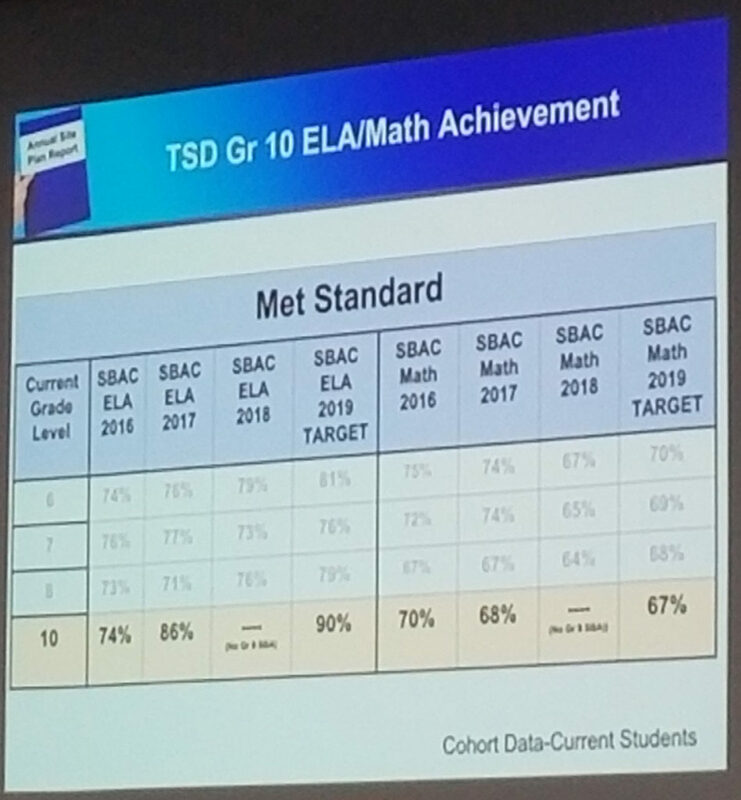 To support this approach, THS Principal Terry Duty displayed a chart showing historical trends of student SBAC scores (below). The statistics above reflect only the number of students who met baseline standards, with no data conveyed regarding the percentages of students who mastered standards or exceeded them. The blanks in the chart are years where there was no official data, although Principal Duty anecdotally supplied “unofficial” stats for the year as more than a 10% decline in math (to 57%) and a less pronounced decline in ELA. When asked about the root cause for the major drop in student performance, Duty cited the high number of changes made all at once in the district when boundaries and teacher assignments shifted. “I’ve never seen a number of changes in a system as great as this recent one,” said Duty. He referenced that the teachers were under a great deal of stress and were struggling to deal with not only the school and assignment changes, but to adapt to these changes while using a curriculum they had only tried once before. While most drop-outs actually leave school in either their junior or senior years, these students are typically ‘lost’ as freshmen. When properly engaged, though, Duty feels that these students can reach a significantly higher level of achievement. While student-centric data was not provided in the meeting, the implication, as I see it, is that these students were stagnant and underserved in middle school, and yet required to spent 7 hours/day in classes that didn’t reach them in the manner they needed. My personal bias suggests that many of these students were, at one point, either advanced or highly capable. If this is the case, then the THS strategy of early intervention could be the best possible help for highly capable students who have been underserved by the district for many years. THS reported that their most concerning deficiency, though, is in their science curriculum. In roughly two years, Washington State will mandate a baseline SBAC science score to be a requirement for high school graduation. The problem for THS, though, is that they have an underwhelming, outdated physical sciences curriculum. “[Tahoma High School] is hoping to find a decent next-gen science curriculum that’s also phenom-based. And hoping is all we’ve got right now,” said Principal Duty. He pointed out that last year, Dawn Wakely, Executive Director of Teaching and Learning, was dispatched to attend an education convention hosted by the National Science Foundation and even there, found no curricula that met THS’s search criteria. At the end of the meeting, Principal Duty spent several minutes praising the school board for their leadership and lauding the quality of Tahoma High School and the district at large. Duty cited the principal of Monroe High School, who said at a recent visit to THS that it was the best-run high school he’d visited.